After symmetry breaking, the recursion comes to a halt, forming a complex, symbiotic equilibrium among the extroversial and introversial forces. In the relevant bi-section (decomposition), the current Formalis action of the objective and subjective ("super") tetra's is distributed among the two sets of 3 orthogonal axes, initiating a (non-Euclidian vs. Euclidian) volumetric resonance. Essentially, if the Z-axis expands, both W-axes contract and vice versa (reminiscent of B. Fuller octahedral symmetry breaking). The "ideal" symbiotic state is still somewhat theoretical, and is characterized by the absence of phasic flow. A phasic or sequential wave is generated as the (mathematical) difference between two symbiotic (synergetic) equilibria. This is physically motivated by the fact that the dynamics of Euclidian space is based on additive synthesis (conservation laws). If the two times 3 orthogonal action potentials are mapped in terms of the (relatively) 2nd. decomposition (sub-tetras), they together form the "VVV-model" ("V-model") of symbiotic engineering. In below graphics, the coloring of the co-creation diagram is based on the latter (Collin style). The idea is that the action potentials, i.e. the V-model, are defined in terms of co-creation, that is, each time at the intersection of sub-tetra's. The V-models themselves could (conventionally) be colored based on the first decompostion, but this might be confusing. In the case of a physical wave, the formal action potentials have translated into the sentient and static pauses, and the accelerative phases, all in real space. 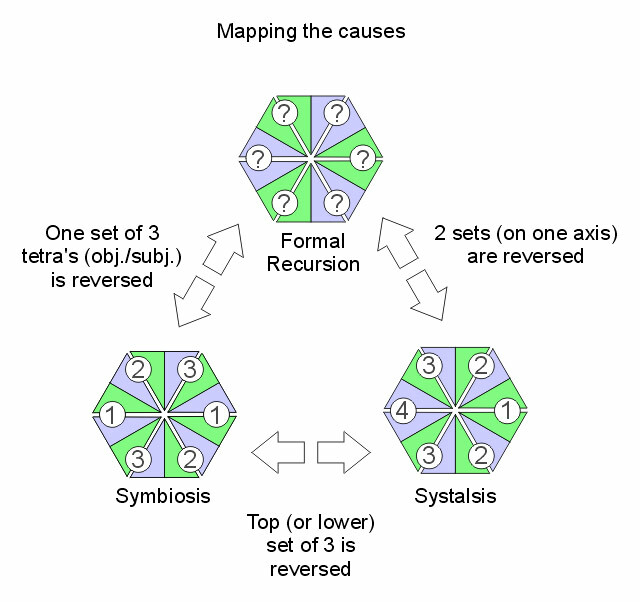 The integral mapping of the causes in terms of the V-models resp. co-creation models shows the more inclusive picture of symbiosis. That is, not a status quo but a complex process involving the recursion, the "ideal" symbiosis and the systalsis all at once. 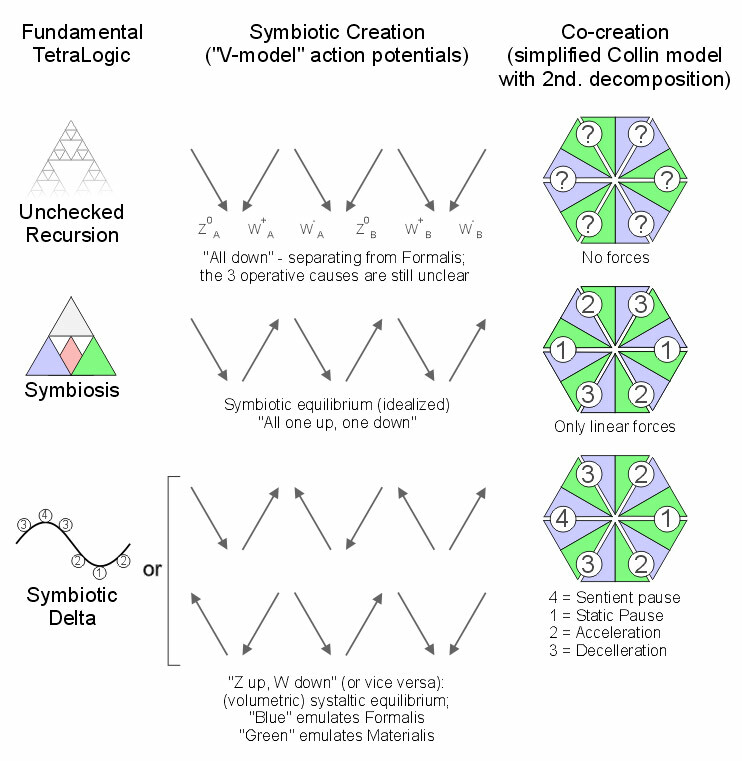 In summary it is shown that in terms of fundamental Tetralogic, the V-Model of symbiotic engineering and the co-creation model of Collin represent the (non-) Euclidian volumetric resonance (of the octahedron) during symbiosis resp. during systalsis. The identities of the 4 causes are fully expressed in the presence of a sequential process, otherwise they remain mostly theoretical. Once a wave is created, the Formalis, which got occluded in the wake of the emerging forces, regains some strength, though in a different form, that is, as the sentient pause of the systalsis. This means that the co-creation model essentially shows a wave, however based on a symbiotic, and not a thermodynamic theme.